We are the Peanut City Cloggers! 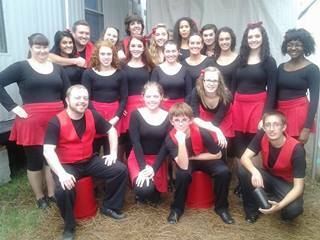 The Peanut City Cloggers (PCC) was officially formed in January of 1983. The team is comprised of female and male dancers ages 7 through adults and provides family type entertainment to the community. The team performs both precision and traditional styles of clogging. Performances run from 30-45 minutes depending on the needs of the client. PCC is currently under the managing direction of Judi Lester. The cloggers practice each Thursday evening at the Bethlehem Ruritan Club, Manning Road in Suffolk, VA. Membership is open to any male or female with clogging ability. Lessons are offered each year, usually in the spring. Peanut City members are always on hand to offer their expertise to all students, youth to adults. We welcome new dancers and if you have the energy and the ambition, contact us for dates and times of lessons.